Pandale, we're told, takes its name from its pan-like shape and it's location in a valley (dale). There isn't as much in Pandale as there once was, but there's still more here than there is for forty miles in any direction. The Official State Highway map shows Pandale as being on the end of FM 1024, which it is. However, it can also be reached heading Southwest out of Ozona, although the paved road ends at the Crockett County line. Pandale had a post office (occupying 6 different locations ) from 1909 until 1977. Their school consolidated with the Comstock ISD in 1969 and their last business closed its doors in 1973. 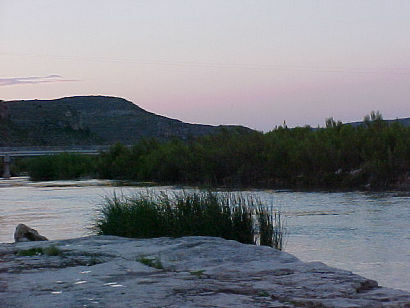 Today Pandale serves as a drop off point for canoeists wanting to canoe the Pecos. The name Pandale is also given to a particular type of arrowhead or "point" that was originally discovered here. 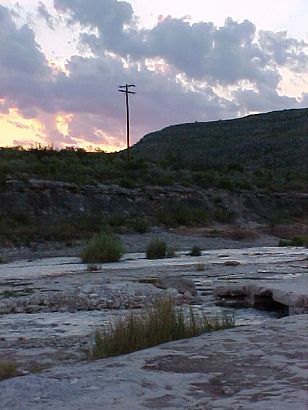 "Pandale and the Pecos River that runs near it is just about my favorite place on earth. My brother roughnecked in that area in the 70's and would always spend time there camping when he could. The scenery is beautiful and the river runs cold even in the 100 degree plus summer days. 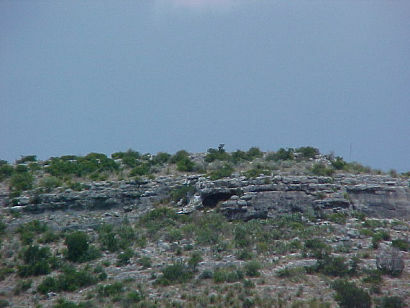 That area of the Pecos River once had a large indian population and while walking along the river bank you will find more worked pieces of flint than is possible to count and in many of he nearby hills it is quite easy to spot indian caves, however, they are all on private property and not accessable unless you "know someone". Up until the mid 90's, FM 2083 that runs from Ozona, through Pandale, and then on to Langtry, crossed the Pecos via a Low Water Bridge and would become impassable during heavy rains. In the following pictures you can see remains of the old bridge and the new bridge in the background." "Now, (the last time I was there in 2005), Pandale does have an open business, a camping area with a small store at the old crossing location. I wish I knew more of the area history, I bet it would be colorful and interesting. 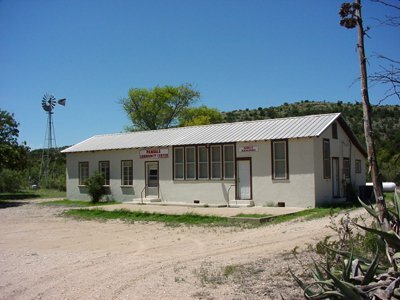 Welcome Station and Judge Roy Bean's Jersey Lily combination Courtroom and Saloon. US 90 at Pecos River - Both sides of Hwy 90 offer rest areas with stunning views of Pecos River South side has more more encompassing view along with picnic tables. My dear mother, Lorene Earwood (Gilmore), spent her young years with her then husband, Floyd Earwood on a ranch near Pandale, Texas. Their marriage would've been 1918-1927 She later lived with her Aunt Ida and Guenard Stephenson on another large ranch near Pandale. She told me many times of how a lady rode horseback across the Pecos River Railroad Bridge to collect her mail!!!! I think that the time frame [was] 1915-17. I cannot imagine anyone in this era doing the same. Do you or any of your readers have any information about this brave woman? 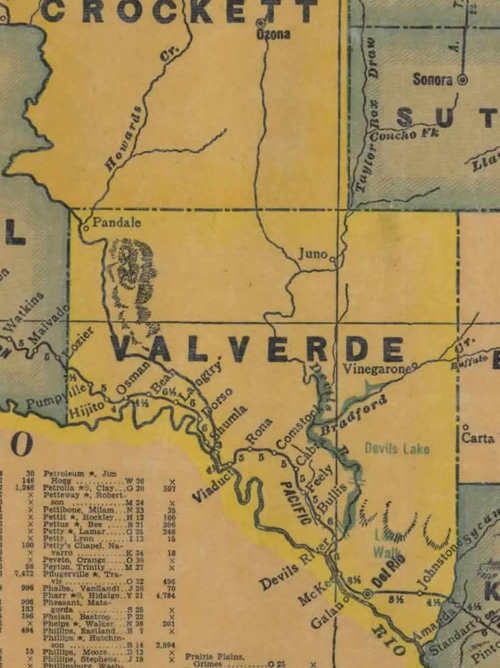 I am sure the Earwood Family(at least some of them) still live the Del Rio, Uvalde and maybe even Pandale area. I know the Stephenson family were prominent ranch family and they lived in Sonora. Mother and Mr. Earwood divorced in 1928-29 . Mother and Mr. Earwood had a five-year-old son named Norman who was dragged to death on the Pandale ranch. He is buried in Del Rio.